Addressing the Pontifical Council for the Pastoral Care of Migrants and Itinerant People in 2004, Pope John Paul II referred to new waves of migration as the 'birthpangs of a new humanity'. Others speak of a new frontier similar to the migrant groups of earlier periods in Australia. Mt Druitt and surrounding areas, with its large numbers of different migrating groups, is one of the focal points of this new humanity. It is the new frontier. Frontiers are times of opportunity but are also risky, raw and hard. Just as Pope John Paul II emphasised the opportunities of a 'new humanity' as well as the pangs of giving birth to new life, in The City's Outback Gillian Cowlishaw shows both the life and the pangs of this new frontier: the hope and the despair, the visions and the realities, of Aboriginal life in this youthful, growing, struggling and fascinating part of Australia. Mt Druitt bears another similarity to earlier Australian times, when Aboriginal people were at the forefront of encounter with the first colonisers. In Mt Druitt lives one of the largest groups of Aboriginal people in Australia: more than 7000 in the Blacktown local government area. One hopes the outcomes on the new frontier are happier than those encounters with the early colonisers. Cowlishaw's great contribution is to enable Aboriginal voices to be heard. She has laboured amid the difficulties of this ethnographic task to hear voices not normally heard, certainly not in the public forum; as Frank Doolan (an Aboriginal man and central character in The City's Outback) would say, to hear voices 'talking under water'. In the earlier frontier times we got little directly from Aboriginal informants. We heard less regarding Aboriginal perceptions of the encounters with the new arrivals. Cowlishaw strives to redress this in our time. Apart from this key theme, Cowlishaw organises her work around several other themes: the pain and bewilderment of life ('History hurts'), the stories of stolen and broken family life ('Writing reconciliation'), survival in the urban environment ('Living skills'), and the struggle for identity — who or what makes you Aboriginal ('Authenticity'). These themes are captured in real stories. One needs to read them to get the flavour and the feeling and above all to see things through the eyes of the interviewees. Cowlishaw defines Aboriginality as an 'embeddedness in a social world' and this is surely right. Doolan asks further questions, such as what are the characteristics of this embeddedness, this bonding. For him there are some moral qualities: 'It's about your rightness ... of belonging' and your right to be angry about things. It is about dealing with whiteness, like being a blackfella in a white school, and social protest, such as campaigns for land rights, dealing with police and with the housing department. It is about symbols: 'red, black and yellow, not red white and blue'. Finally, 'The only way to get out of the struggle is to renounce your Aboriginality, go underground.' It is interesting that few speak of traditional culture in the context of Aboriginality. A contentious issue is Barney's characterisation of the 'gimme tribe', which he describes as 'cultural extended family abuse ... they eat you out of house and home ... and then move on to the next house'. The practice is referred to as 'demand sharing' in many parts of Australia. Cowlishaw describes Barney's account as extreme, that the behaviour is 'manners', and denies that it tends to keep people in poverty. I believe demand sharing is more significant than Cowlishaw would have it. In the 1998 book Economies and Personhood, Gaynor MacDonald treats the question seriously among the Wiradjuri of central and southern New South Wales. Demand sharing is alive and well among the Wiradjuri long after cultural forms such as hunting, gathering and traditional languages have largely passed. McDonald and others argue that the importance of demand sharing lies not in its economic role of obtaining material goods but in its expression of relatedness and hence belonging. It is a core social value and a keystone of Aboriginal identity. Australians need to hear the articulation of Aboriginal people to the nation. We need to hear of the perspectives of Aboriginal people. The majority needs to engage in its own struggle for an identity which is embraced by the Aboriginal identity. Although many might wish to forget or deny the realities of Aboriginal history and contemporary issues, others find this inescapable because we cannot understand ourselves without relationship to Aboriginal people in this land. The City's Outback is good for all of us. Pat Mullins SJ is assistant priest at Mt Druitt and the Australian Jesuits' Assistant for Ministry Among Indigenous Peoples. Recent articles by Pat Mullins. 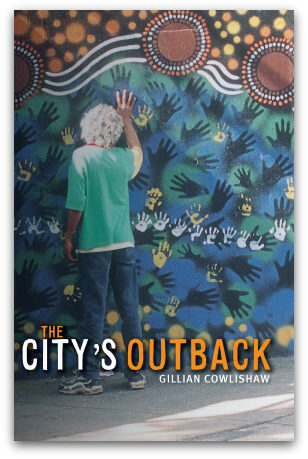 Topic tags: Gillian Cowlishaw: The City's Outback. Sydney, UNSW Press, 2009. ISBN: 9781921410871. I am a PhD candidate at Murdoch University (Perth). I am currently researching the 'vulnerability' od Australian Aboriginal people. In particular, I am focusing on young Indigenous men in relation to gender issues in Aboriginal communities, and the relationship to suicides. By the end of this year, 25,000 or more Indigenous people will have graduated from universities, 20,000 since 1990. Currently, commencement, enrolments and graduations are at record levels. Around 80,000 Indigenous people have been to university at some time or other. By 2020, there could easily be 50,000 (fifty thousand) Indigenous graduates, around 8,000 with post-graduate qualifications. By 2034, 25 years away, there could easily be 100,000. Opportunities are there, but they have to be grasped. Mt Druitt is what ? five miles from Nepean Campus of UWS ? Carpe diem !